Welcome to backlink extractor tool by SEO Tools Centre (STC) that extract all the backlinks pointed to your website/domain. Backlink plays a vital role in the search engine optimization process. Backlinks are very essential for a website as water and food for the human body. Also, try out the "Moz Backlink Extractor" for Moz backlinks extraction and "backlink maker" to create up to 50 unique and high PR quality backlinks instantly with your website to speed up the indexing process and beat up your organic competitors. Now, in 2016 after "panda 4.0 update" the SEO drama is completely changed. So, Google strict the SEO policies. Backlink extractor is specially designed to audit your backlinks because Google says that you are responsible for every inbound and outbound links pointed to your website/domain. So, it's very necessary to stay in touch with your all of your fresh and old backlinks of your website because a single bad/spam backlink can hurt your website organic traffic and ranking also. Always try to build up the quality, do follow and niche related backlinks. Backlink Extractor/scraper is an instant backlink extracting tool which is proudly designed and developed by SEO Tools Centre. By using STC backlinks scraping tool you can analyze up to 1000 at a time and have the option to export in CSV format for later use. Unlike other poor backlinks checking tools those offers the limited number of queries and ask for subscribing the pro package but SEOToolsCentre's backlink extracting tool solve all of that because it's free forever. SEO Tools Centre (STC) is dedicated to providing the most valuable and useful tools for SEO purpose including backlink audit/examine tool to provide rich users' experience. Why is backlinks audit necessary for a website? Backlinks are very necessary for a website and play the role of the backbone in the SEO strategy. The online marketers willing to pay up to 100$ from a good authority and authentic web page and a backlink can speed up your website ranking process within the search engines. Google confirmed that the web owners are responsible for all inbound, outbound, good and bad backlinks. So, it's very very necessary to audit your backlinks if you want to stay live in the ranking and SERPS. 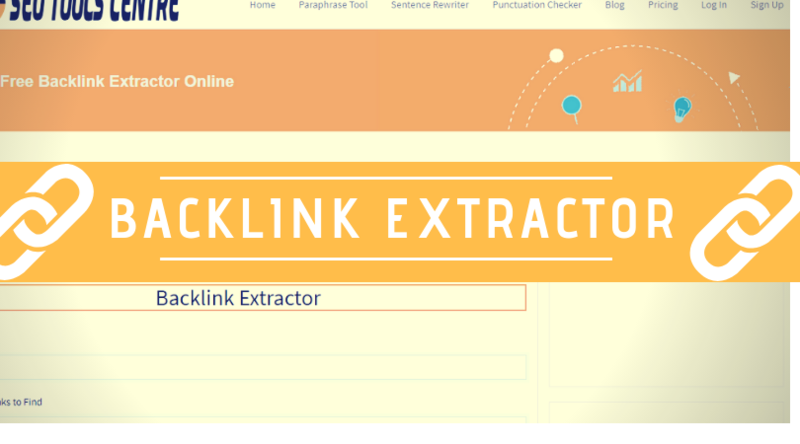 How Does Website Backlink Extractor Tool Works? Our backlink extractor/analyzer works very smoothly and instantly provide the 100% accurate results. Unlike all other available backlink checking tool, we don't offer fake reports. Our Backlink extraction tool completely scans the entire website and calculate the backlinks for Google and other search engines database and display in front of you. Our tool displays exact page where your website is linked with their anchor text and also inform about link type that it's do-follow or no-follow. You can export all of your website backlinks within a single file in the .csv file for later use. How to use SEOToolsCentr's Backlinks extraction/checker tool? It's very easy to use STC backlink extractor tool, unlike other tools. Just type your website/domain URL as example.com and select the number of backlinks which you want to extract. You have the option to select 50,100,500 or 1000 links at the same time and click on the submit button. Within the matter of few seconds, your output will be produced and you can export file in your favorite file format to examine it and submission for disavow. Note: We also offers the backlink maker tool to create the high PR backlinks and broken links checker to analyze and fix the broken pages of any website with a single click. Copyright © 2018 SEOToolsCentre.com. All rights reserved.